Under siege? 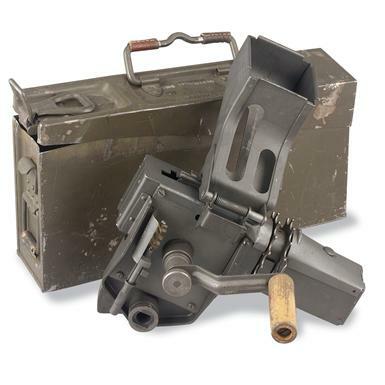 This used MG42 Ammo Belt Loader makes the most of your machine gun nest! Judging from the outcome of WWII, the Germans should have made more of these. But they didn't, so that makes the few surviving examples rare collector's items indeed. Fully functional and extremely rugged, the entire system fits in a 14 x 3 3 / 4 x 6 3 / 4 " ammo can (included!) and weighs 11 lbs. Makes quick work of loading the MG 42's ammo belts. May come with a cleaning brush. If you're a collector, you're in luck. Please Note : This item works with 7.62 mm ammo only.